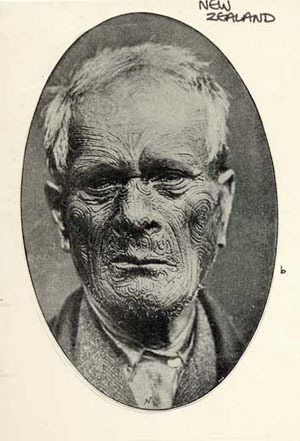 The Maori warrior tribes of New Zealand used face and body modification as a way to revere their exalted members or chiefs. 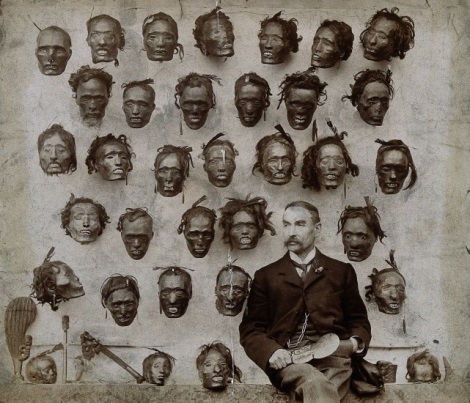 However, the beautiful nature of these patterns meant that severed Maori heads became currency, either being swapped by tribe members for the new muskets which were flooding into the country in the 1860s, or being bought for cash by curio-collecting Westerners. The modification or ‘moko’ was a mixture of tattooing and scarification, carried out with a uhi – a small narrow chisel. These uhi were made of bird bones, shark teeth, stone or hard wood and had different surfaces, sizes and shapes depending on which part of the flesh they were to be used on. The blade was applied to the skin and a mallet called a He Mahoe was used to tap the blade, driving it into the skin and causing a deep cut to administer the pigment. The pigment was usually the burnt and powdered resin of the Kauri Pine although charcoal and gunpowder were known to be used. Sometimes the cuts went so deep in the cheeks they actually made a hole through which the Maori’s pipe smoke would escape as he puffed away! The pain was excruciating – a rite of passage – and the resulting ‘tattooing’ was rough to touch with deep canals into the flesh. The patterns were dependant on the wearer: In males, the chiefs had their faces and bodies covered with designs, and although the other men were usually tattooed on the face, hips and body (as low down as the knees) they were not allowed to be decorated on the forehead, upper lip or chin as those spaces were solely reserved for the “great ones of the tribe”. 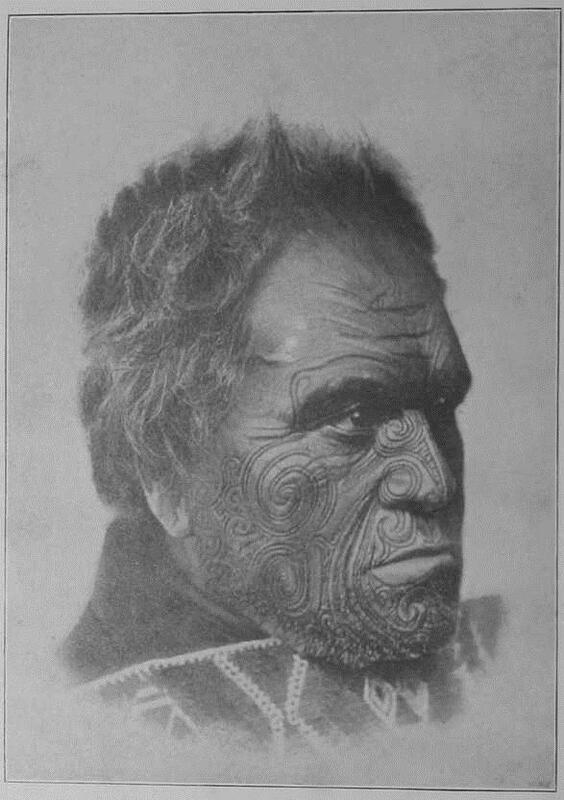 Women also received certain marks of the moko, mainly on the lips and chin but sometimes on either side of the nose. It was considered attractive for Maori women to have blue lips, rather than red which was “looked on as a reproach or disfigurement”. Priests were exempt from the tattoo, and slaves were forbidden – at first. 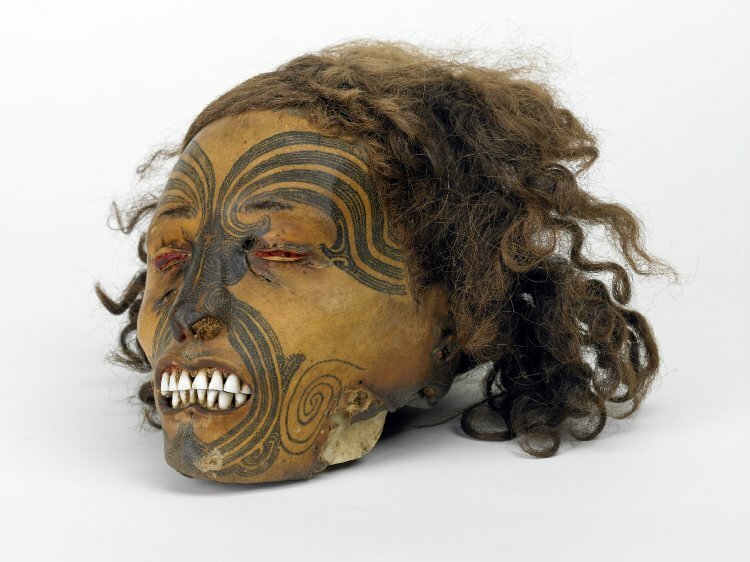 The whole purpose of the moko was identification of a Maori warrior’s head if it was cut off by the enemy in battle, and also to distinguish a noble or freeman from a slave. To this end the patterns on the faces, consisting of spirals which were symmetrical, still differed from one man to the other. However, the spiral pattern on the buttocks was always the same. The deep tortuous lines of moko added fierceness to the features and in order to show it off to its best advantage beards and facial hair were forbidden. In fact, rather than shaving, the men had to submit to having their beard hair pulled out by the roots too. 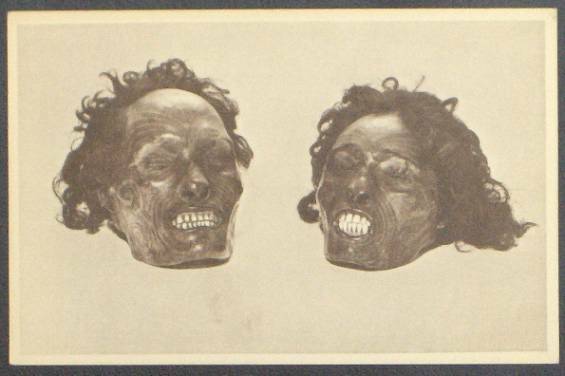 After all this suffering and attention to detail it’s easy to see why preserving it by creating mokomokai (cured or embalmed severed heads) was part of the Maori’s practice. The methods in which they were cured differed slightly from one tribe to the other, in the same way that Egyptian embalmers had their own spin on their technique in order to acquire an enviable distinction. Whatever the method, the brain was removed first – a step sometimes described as “the removal of all mucilaginous and fleshy matter”. Then the eyes and tongue were taken out and those orifices sewn closed. The head was sometimes fully stuffed with flax, other times only the eye sockets and nostrils in order to preserve the shape. Then came the various methods of applying heat to remove the bacteria which would exacerbate decomposition: most commonly there appears to be periods of wet heat first: either the head was steamed by wrapping it in leaves and placing it in a fire, or placed into hot boiling water into which hot stones were continually thrown to keep up the heat. Then came dry heat: alternating periods in the heat of the sun with the smoke of a fire. Eventually the head was anointed with oils, feathers sometimes placed in the hair and the skin at the base (the foramen magnum) drawn together like a pouch. 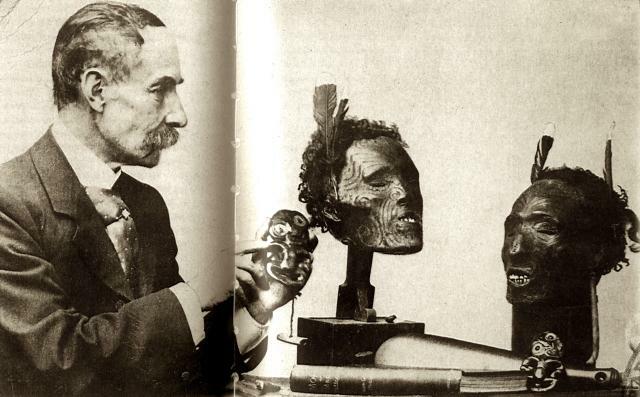 Traditionally the removal and curing of the head was an acknowledgement of the nobility of its owner. It gave a focus to grief straight after bereavement and kept alive the memory of the departed among the tribe. Major General Horatio Robley (a talented illustrator, writer and ethnographer) states, “In the case of a departed chief of a tribe it was a visible sign that in some mysterious way his presence still dwelt amongst his people, inciting them to emulate his virtues, and to follow in his steps; while in that of the slaughtered warrior mokomokai it served to keep alive the memory of the injury received by the tribe in whose possession they remained, and afforded a constant challenge to revenge and retaliation.” These heads were kept in boxes or baskets scented with oil, then brought out at special occasions with songs and praises. They were decorated with feathers and placed in a conspicuous position round the table or in the centre of a gathering. It was also customary for some wives of dead chiefs to lie in bed at night with the heads of their deceased husbands by her side. However, their intricate beauty made them a wanted commodity for people travelling from the West. Much of the Maori’s practices were documented by Captain Cook in the book he wrote on his return from New Zealand in 1771 and it was not long after he had left the shores of New Zealand that the trade in heads began. The first one ever purchased was, in fact, by a member of Cook’s crew. This initial sale was carried out reluctantly on the part of the Maori but that changed all too soon. They were sold not only for cash but swapped for muskets, which were being introduced to the Maori by the incoming Europeans. The tribes needed to obtain muskets in order to protect themselves from others who had firearms in an unfortunate catch 22 situation, and when the supply of genuine heads was diminished, mokomokai had to be “created”. Unfortunately, for many slaves, this was the only way in which they would receive the moko – they were simply tattooed, allowed to heal, then promptly beheaded and cured in the way described above to be sold on as chiefs to unsuspecting collectors. ‘Yes,’ said I, turning round just the least thing quicker than ordinary. ‘ ‘Eds has been a getting scarce,’ says he. ‘I should think so,’ says I. ‘We an’t ‘ad a ‘ed this long time,’ says he. ‘One o’ them ‘eds has been hurt bad,’ says he. ‘I should think all were, rather so,’ says I. ‘Oh no; only one on ’em,’ says he. ‘The skull is split, and it won’t fetch nothin’,’ says he. ‘Oh, murder! I see, now,’ says I. “They had to tattoo a slave a bit ago,’ says he, ‘and the villain ran away, tattooin’ and all!’ says he. ‘Bolted afore he was fit to kill,’ says he. ‘Stole off with his own head?’ says I. ‘That’s just it,’ says he. I walked away, pretty smartly. ‘Loose notions about heads in this country,’ said I to myself. As comical as the above exchange sounds, the traffic in these heads did become a public scandal after costing many innocent people their lives. The Maori themselves became possessed of all the arms they needed and discontinued the practice which had become repulsive to their instincts and which they had really only adopted as a desperate attempt to preserve their tribes. An act was passed in 1831 which made the trade illegal and punishable by a fine although there no doubt was a black market in what are known to Westerners as ‘baked heads’ and of course many of them have ended up in museums. The museum I curate, Barts Pathology Museum, repatriated the remains of Papua New Guineans long before I arrived here and the trend is of course to return pieces such as mokomokai back to their ancestral home. Recently Birmingham University was in the news for holding a traditional funeral ceremony in which a Maori preserved head and bones were returned to Wellington via the University of New Zealand. The article states that more than 400 Maori items were believed to still be in collections in the UK and with the practice of collecting human remains from other cultures being described as an “example of one historical practice we’re deeply ashamed of” perhaps it is time the rest were repatriated too.